That's not a lunchbox. That's one of the most discreet, fully functional pistol cases around. Part of Voodoo Tactical's Discreet lineup, this pistol case includes three uniquely sized hook-and-loop holsters to carry just about any size pistol and eight magazine loops to carry plenty of ammo. 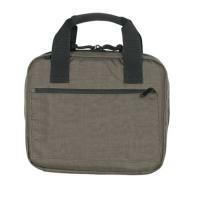 The body of the case is made with 1000D cordura nylon and finished with secure stitching and high-quality zippers. The interior features a large central divider that doubles as a zipper pouch. The pouch includes three smaller, attached pockets for carrying small items. The exterior includes a zippered pocket that is the length of the case, perfect for quick access to extra accessories in tow. On top is a rugged, reinforced handle. The lockable zipper pulls keep the case from inadvertently opening and detract from theft. The Discreet Pistol Case is G.S.A.-compliant.